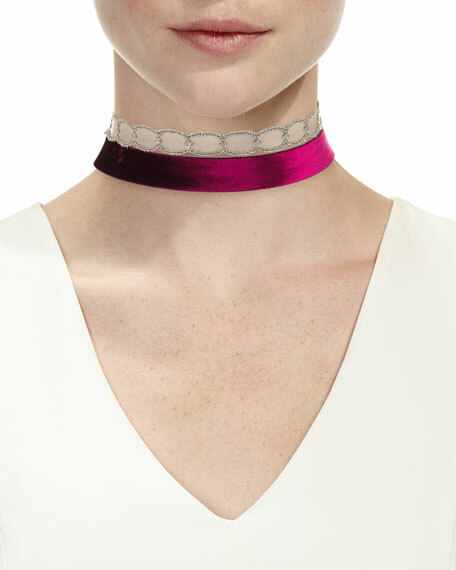 Chan Luu two-piece choker necklace set. Metal lace and velvet with silvertone hardware. Lobster clasps with chain extenders. Power gemstone adjustable necklace by gorjana. Polished 18-karat yellow gold plating over brass. Your choice of octagonal gemstone pendant. Black onyx, howlite, pyrite, rose quartz or turquoise. Approx. 18"L chain; 0.3"L pendant. Adjustable; spring ring. Imported. Please note: Natural color variance may occur for genuine gemstones. KALAN by Suzanne Kalan mixed firework pendant necklace. Polished 14-karat yellow gold cable chain and hardware. Integrated signature "fireworks" mixed-stone pendant. Two round white diamonds; 0.05 total carat weight. Two baguette-cut morganite topaz stones. Two 4mm round pink topaz stones. Adjustable, approx. 16-18"L. Lobster clasp. Made in USA.